Yahoo Messenger will no longer be supported after July 17, 2018. Until then, you can continue to use the service normally. After July 17, you’ll no longer be able to access your chats and the service will no longer work. There is a new messaging app called Yahoo Squirrel, but that’s currently in a private beta. There is no active replacement, from Yahoo, for the shutdown of Yahoo Messenger. On July 17th, 2018 the app will stop working, that includes PC and mobile versions of Yahoo Messenger. Once you download your chat history, all you can do is enjoy the last month of the service (enjoy the memories) and then delete Messenger from your devices. This shutdown is only for Yahoo Messenger. Your Yahoo ID on other Yahoo products like Mail, and Fantasy Sports will continue to work. 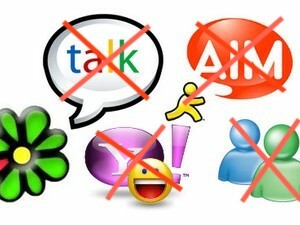 With this shutdown, following the shutdown of MSN/Windows Live Messenger, AOL’s AIM Messenger, The Original Google Talk Messenger the only original chat application is ICQ (for those who go back that far).